All Watercolor Tips are FREE! 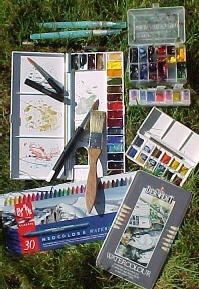 Painting on Location / Outside / 'en Plein Air! others prefer to use a TV tray or lap board and paint seated. Old or inexpensive doormat to keep chair from sinking into soggy grass. Insulated lunch box or small ice chest for cold drinks/water. Get out and paint! 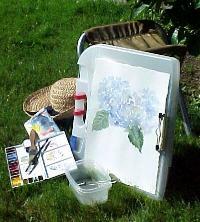 There is nothing like painting outside....'en Plein air!